Maintaining your Jacksonville fence, dock or deck will add longevity and an attractive touch to your home's exterior. Paint and stain produce amazing cosmetic effects, provide decks, docks & fences with protection against the harsh Jacksonville, Florida elements. Keeping your fences, docks & decks properly coated will not only give them a face-lift, it will add years of life by protecting it from the harsh Florida elements. This will help with costly wood repairs or replacement; saving you money. Painting, sealing or staining fences can be a daunting & time-consuming task. Proper preparation is a must! By doing it periodically, you can strengthen the fence, prevent wood rot or rust and splitting; reducing the likelihood of replacement. Even metal fences and railings can benefit from the regular proper maintenance. 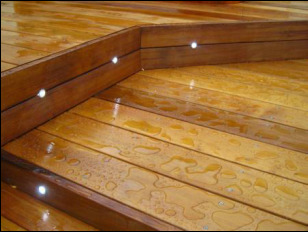 See our blog to learn more about the best deck stains for your staining project. Exterior decks and docks should be re-stained or sealed every 2-3 years. Pro Color uses the best stains, sealers and deck coatings. Call the exterior deck & dock coating experts at Pro Color Jax before splitting wood, wood rot, cupping and other problems become a nightmare. A fast, hassle free evaluation is just a phone call away.